For a ghoulish good time, catch Rosebud, B-Dawg, Buddah, Budderball, and Mudbud in their all-new Halloween-themed movie! SPOOKY BUDDIES continues the overwhelmingly popular Buddies series that features the adorable talking puppies and combines it with action, laughs, and fast-paced adventure. Spooky Buddies (Two-Disc Blu-ray / DVD Combo in Blu-ray Packaging) comes out on Blu-Ray and DVD on September 20 – just in time for Halloween parties and Halloween themed family movie nights. 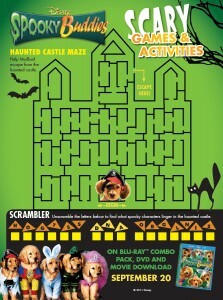 To get you ready for your own Spooky adventure, here is a printable maze and activity sheet for the movie. Click on the image above to view and print the Halloween maze full size or you can download the Halloween maze as a PDF file.